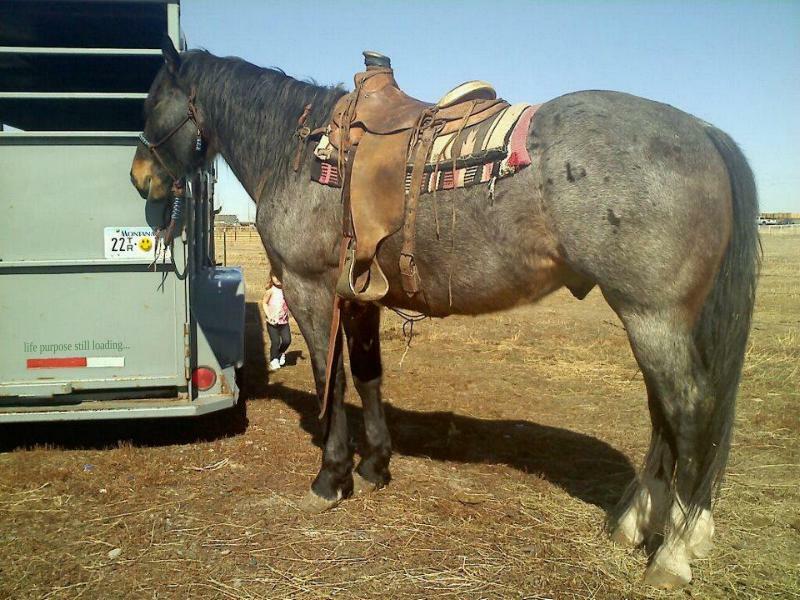 Stolen: Trooper -- AQHA Crow Fair Hancock AQHA 4904280, DNA Case No. QH979821, 2005 "bay roan" (brown based, looking blue) gelding, 16.1 hh, 1425 lbs., 2 hind fetlocks and left fore inside 1/2 coronet white, star. Freeze branded. Carrie knew she stole the horse from me and she knew I didn't have a signed contract from her. Carrie brot the small claims case against me, to accuse me of breach of contract, because she thought she could win it by default. The local deputies told me that she had done it before, and knew how to beat the system. A small claims court case in Chicago brought against me, 1000's miles away, costed her only a few dollars. She knew she'd already costed me two cross-country trips to find and recover my stolen horse; she figured I would not be able to afford a 3rd trip to fight a small claims case across the country. If she won by default (me not showing up) she could then claim to the public (potential transport customers) that I was the one that broke our contract, and "proved" it in a court of law. She did not win the court case, because I did show up for court. She did not show up the second court date, because she knew I had the proof of our contract (see below). I regret that I could not afford to return to Chicago a 3rd time, and counter-sue her. I had planned on doing that but my situation changed. She was lucky, because I would have proven in a court of law that she committed perjury, made a fraudulent, frivolous false claim, and stole a horse. I would have been awarded damages, and she would have had a permanent record of her breach of contract and stealing my horse, on her credit report for the rest of her life. 2016 UPDATE: Good News! I have it on good authority that Ms Freeland, "Carrie said she junked both her trucks. The good news is she is now driving Uber in Chicago and I am sure she isn't doing much horse trading in her sedan." Actual Agreement: “Trooper,” AQHA Crow Fair Hancock AQHA-4904280 2005 green-broke roan gelding, 16.1 hh, 1425 lbs, (horse) valued at $3500 belonging to family (Donna, Sterrin & Valene, permanent brand inspected owned in Sterrin's name, freeze branded on left shoulder with Sterrin & Valene Hackney's brand) was permitted to be taken by Carrie Freeland to the Chicago IL area for a few months until we sold him. 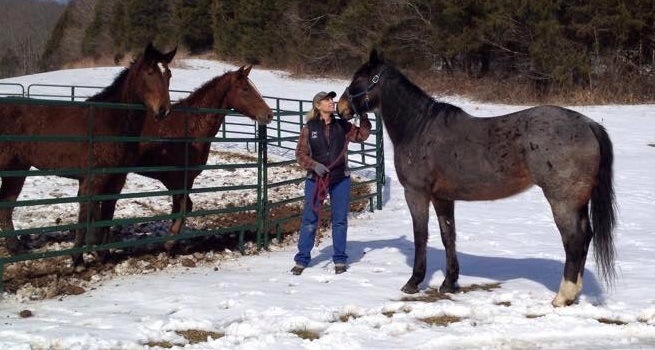 Carrie and Donna agreed that Carrie Freeland and daughter, Nicole VanderHeyden were responsible for safekeeping, and any financial investment of hauling, reasonable care & any (optional) additional riding and/or training they wished to put into him from May 9, 2014 to fall 2014, in anticipation of further increasing horse's value. Any profits above $3500 may be kept by Carrie and/or Nicole, when horse is ready to sell, which is expected to be in 90 days of riding, or fall 2014. In fall of 2014, a sale is anticipated, in which Donna would do the marketing (thru hancockhorses.com) and Sterrin would get $3500 of sale price, anything over that to go to Carrie and Bobbi. That was the actual agreement made between Carrie A Freeland and I, on May 9, 2014. 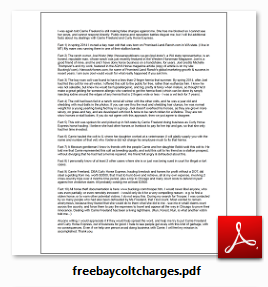 Click above paragraph to open the whole agreement - I have copied and pasted the entire 2014 Facebook conversation made between Carrie Freeland and I, that shows us making our horse deal. The red text clearly outlines the agreement made between Carrie, her daughter Nicole "Bobbi" Vanderheyden and I. This was the contract that Carrie Freeland defaulted on, from which she then actually went on to steal our horse. You will see Carrie clearly indicated her agreement that she was to put investment into Trooper (using her trainer for free, Javier) to increase his value when I advertised him that fall, and that I agreed to let her and Bobbi keep anything I could get over $3500. I have made no changes to what she typed to me (nor what I said to her). I did delete much of the non-content triple-spacing and superfluous FB littering to keep the document legible. I have the original transcript before I cleaned it, if you would like to examine it for authenticity. I will also give permission to Facebook to release an original transcript of this to any official agency, for legal proof of her deception, fraud, breach of contract, and subsequent theft of my horse. 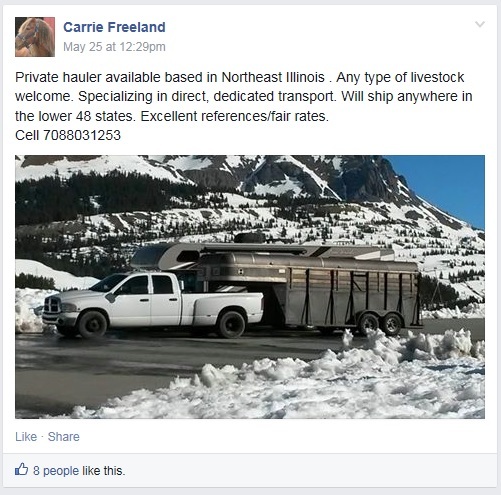 As of 2015, Carrie Freeland was still actively advertising and hauling horses and livestock to the public, for hire. Carrie advertised as Curly Horse Express. She had a profile on uShip, and this particular ad (screen shot above) was taken from Wes Autry's Facebook page, Livestock Haulng Connection (I think that misspelling is really its title). Freeland also advertises on Vicki Henderson's Facebook page, called Hitch A Horse A Ride, (the much smaller one with this title, not the large, established one) or something similar, and other transport pages. The last I knew, Autry and Henderson were still actively supporting and recommending Carrie Freeland on Facebook, and actively promoting her transport business, Curly Horse Express - even while aware that Carrie ran illegally without a DOT, without paying income tax on her business, and, that she stole my horse. They could have stopped promoting her by now, but I don't know. They all blocked me. 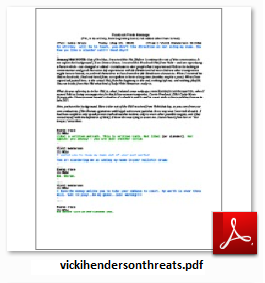 Vicki Henderson's Private Message she made to me on Facebook, threatening me with her claim of considerable monetary advantage over me, if I did not remove her name from this incident report on my webpage publicly accusing Carrie Freeland of horse theft. I never did figure out why Vicki cared, or why she protected Carrie Freeland, or tried to intimidate me. But because of that, (I transported livestock at the time also, but legally) I opened a second Livestock Hauling & Transport page on Facebook. Here, I keep a page available to livestock owners and haulers where we can at least try to avoid supporting the crooks & thieves. If you own or haul livestock, you are welcome to join it, and post your transport needs & services there. If you run across any unethical carriers or shippers using this page, message me privately, and we will keep it cleaned out the best we can. BTW, since I retired, I don't transport any more, so my interest is less, and I would love to find someone interested to help administer this page with me now. 2016 update. I originally posted this webpage when I realized Freeland had stolen Trooper; to help me find him. Since I found & retrieved Trooper, I left this webpage up to provide documentation of willful & deliberate theft, with cheating and fraud committed by Carrie Freeland and her daughter, Nicol (Bobbi) VanderHeyden and associates. This is to provide a warning to anyone considering doing business with Freeland or checking for references. To deal with Freeland or her daughter VanderHeyden, in any business dealings, any horse transaction, or to hire Carrie Freeland for any horse or livestock transport, is to take unnecessary risk with your animals. I took Trooper to a good hand in Arizona. Trooper may or may not now be sound - he may or may not now become safe for an average rider. It remains to be seen. But if anyone can help Trooper, it is my friend. We do not know what Carrie and Bobbi put Trooper through, but, Trooper has given us some pretty fair indications what he has been through, and it isn't good. He is still friendly though, happy and safe now, and hopefully on his way back to normal. My friend who I gave him to, often says when I ask how Trooper is doing: "I'd sure love to get in touch with whoever 'trained' him... (my hands around their throat, that is)...". Weird, isn't it. If Carrie were an honorable person who was a decent hand with horses, I probably would have given Trooper to her IF he had come up lame, IF through no fault of hers. As it is, her actions tell me that she or her trainer Javier may have lamed him. Either way, time will tell, and regardless, it changes nothing in our agreement, and certainly does not excuse horse theft. I will answer questions, provide additional proof or give anyone references; just email me. That, and hoping for Trooper's full recovery, is all I care about any more, regarding this incident. Public webpage kept by Cook County 6th Circuit Court, Chicago IL. I had a 2nd court date with Carrie on June 24th, 2015 in Chicago IL. Although Carrie lives a few miles from her courthouse, and I live across the country, she did not show up in court. This is a case she originally brot against me in January, and it was shown to be without any substance in court, and thrown out. But it was without prejudice, so Carrie played her cards and brot it up again for June. In June when I appeared, the judge told me that if Carrie wished to bring in a written contract supporting her allegations against me, he would hear her. I smiled (because I know the only contract that exists she has (or burned) would only show she stole my horse). Then he smiled, (I believe he believed I was telling the truth, and that justice was served as well as he was able to). January 29, 2015. 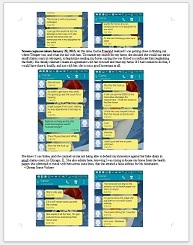 Click to open & read saved screenshots texted by Carrie Freeland [warning: foul language]. Here you will see when she decided in January (I was getting close to finding Trooper) to sue me in small claims court, to give herself an alibi or excuse for having stolen my horse - to convince others of her innocence. She decided to claim that I owed her board and training (without a contract of course, since none exists, except for the one I sent with her when she took Trooper, outlining our real agreement, which also proves she stole Trooper) and she thought a judge would award her the default judgment if I could not afford to travel to Chicago IL to prove her claim was false. You will also see her mention falsifying the destination address on her Health Inspection when she stole Trooper in Nov 2014. 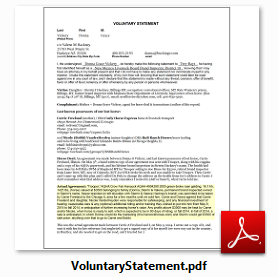 Click here to view .pdf copy of the health certificate Carrie and/or her daughter (Nicol VenderHeyden) "Bobbi" falsified for transport. and that Carrie brought Trooper to Dr McCune to get a health on him, for Carrie to transport Trooper out of state. Bobbi refused to tell me where she and/or Carrie took Trooper, or if they sold Trooper. She told me she would look up the name and address of that was on the CVI health consignee record, and give that information to me the next day when she was at work. But she never did call me back. Dec 31st. I used the veterinarian's name to find his contact information and called Dr McCune on Wednesday. I asked him for the information on Trooper's health so that I could find Trooper. Dr McCune told me if I would provide him with proof of ownership, he would give me that information. I faxed him a copy I had kept of a coggins that I had sent with Trooper for Carrie and Bobbi. I did not hear back from Dr McCune. Jan 2015. I called Dr McCune again, on January 7th, and still did not hear back from him. The office left a voicemail message stating they were closed that week due to a bad blizzard. I again faxed him all the ownership info, including the registration certificate, the permanent brand inspection, the coggins again, and all my contact information, in case he did not receive it the first time. Then I waited until I thought he should be back to work. I called Dr McCune on Jan 12, again on Jan 15, Jan 17, and on Jan 20th. Dr Paul E McCune refused to answer or return any of my calls. To this day, I do not know if Dr. McCune was complicit in the actual horse theft, or if he was simply unwilling to deal with his employee's deception. Like a lot of us, I suspect he was simply avoiding drama. July 2015. In a bait and switch effort, Carrie Freeland (on Facebook) was trying to divert attention away from her horse theft to an (unrelated and) equally false issue where she is trying to garner sympathy for her cause, and direct outrage toward me by claiming I breed crooked, poor quality horses and abuse and/or neglect them. And that everything she did, she did trying to help me out. Well, let's indulge her distraction, and have a look at 10 facts regarding Ms Freelands accusations that I cost her money on a neglected bay roan colt. February 2015, when I found Trooper, I notified the local sheriff and worked with the local brand inspector, Trey Bays [575-639-2612] of the New Mexico Livestock Board, Dona Ana County, Sunland Park, New Mexico. The state of New Mexico officially then took Trooper into custody and impounded him. Trey warned me it could take weeks for officials to research the case, and decide whether to release Trooper to me. However, as soon as the higher up officials in the NM Livestock Board received my sworn statement the investigation was concluded in 1 business day, and I was called to come pick Trooper up. Libel is a method of misinformation or defamation expressed by print, writing, pictures, signs, effigies, or any communication embodied in physical form that is injurious to a person's reputation, exposes a person to public hatred, contempt or ridicule, or injures a person in his/her business or profession. Libel is the written or broadcast form of defamation, distinguished from slander, which is oral defamation. It is a tort (civil wrong) making the person (or entity like a newspaper, magazine or political organization) open to a lawsuit for damages by the person who can prove the statement about him/her was a lie. "tu ne cede malis, sed contra audentior ito"